Governments have had over a decade to incorporate secure, and functionally interactive features into agency websites-oriented toward the provision of public information, services, accountability, and transparency; various evaluative schemes have been proffered to measure their progress and relative effectiveness. While no single standard evaluative tool has emerged, a number of efforts have yielded useful benchmarks though a number have also been limited in overall scope with little reference to strategic planning; often reflecting the perspectives of information technology specialists or administrators and not the broader interests of stakeholders. What is generally missing is a comprehensive development gauge that includes technical functionality in the areas known to be essential to effective e-Government site development. This piece builds upon previous work in site evaluation and presents an applied strategic inventory tool that might more comprehensively address e-Government Web development on the dimensions of security, database integration, internal communication capacity, lateral interagency capacity, citizen interactivity, and transparency of government process. The e-Government applied inventory tool features a matrix based upon the presence or absence of three key indicators associated with each of the six dimensions of site effectiveness. This evaluative model is applied to the ministerial websites of six selected countries; Djibouti, Finland, India, Kenya, Namibia, and Peru. 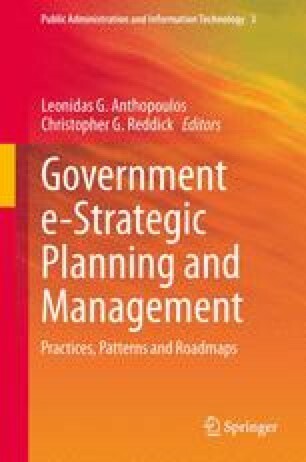 The chapter ends with a discussion on the likely correlations between this e-Government strategic development tool and its possible utility as a measure of relative political development. Alghamdi, I. A., Goodwin, R., & Rampersad, G. (2011). E-Government readiness assessment for government organizations in developing countries. Computer and Information Science, 4(3). doi: 10.5539/cis.v4n3p3. Assange, J. (2009). Gmail may hand over IP addresses of journalists. Wikileaks. Retrieved May 2, 2012 from http://mirror.wikileaks.info/wiki/Gmail_may_hand_over_IP_addresses_of_journalists. CYPRG (Cyberspace Policy Research Group) (2001) ‘Web Attribute Evaluation System (WAES)’; URL:http://www.cyprg.arizona.edu/waes.htm. Layne, K., & Lee, J. W. (2001). Developing fully functional e-government: A four stage model. Government Information Quarterly, 18(2), 122–136. doi: 10.1016/S0740-624X(01)00066-1. Open Net Initiative. (2009). Internet filtering in the Middle East and North Africa. Retrieved April 21, 2012 from http://opennet.net/research/regions/mena. United Nations (2012) E-Government Survey Measurement Criteria http://unpan3.un.org/egovkb/egovernment_overview/webmeasure.htm Retrieved March 20, 2013.